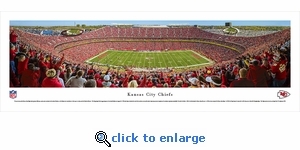 This panorama of the Kansas City Chiefs, taken by James Blakeway, captures fan excitement at Arrowhead Stadium, as the Chiefs score a touchdown on their way to a victory over the Cleveland Browns. The Chiefs played their inaugural game at Arrowhead Stadium on August 12, 1972 and today Arrowhead has stood the test of time as one of the nation’s top venues for fans to experience the excitement of professional football. 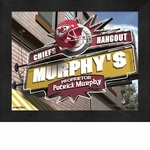 Founded in Dallas in 1960, the club relocated to Kansas City, Missouri, in 1963 and was renamed the Kansas City Chiefs. In 1969, the Chiefs became the only club in AFL history to win three AFL Championships. 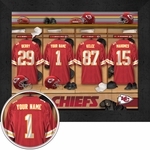 The Chiefs went on to victory in Super Bowl IV in January 1970.